The first full version of Minecraft was released in November 2011 and since then has taken the world by storm. In less than three years, this game has grown by leaps and bounds. Currently, Minecraft has upwards of fifty million users and is growing at a rate of about 17, 000 new ones every day. 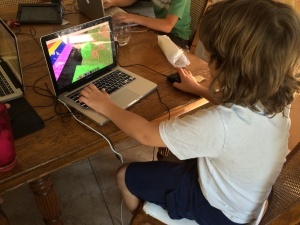 Chances are, if you have a child, he’s been exposed to Minecraft. If you ask a kid whether they would rather play Minecraft or study in their reading, writing or math book, what do you think the answer would be? I think we all know what the answer would be. And maybe they are onto something. I’ve watched my two boys excel at reading playing Minecraft. How can this be? It’s simple. They’ve found a useful reason to learn to read or to extend their reading skills. It makes sense to them. The motivation to read emanates from their desire to advance in the game. Websites like WikiHow and various blogs possess valuable information on how to build structures, make tools, set up servers, fight monsters and more. If reading words is the only thing standing in the way of a child getting that information, he will learn to read and do it quickly, perhaps with a little help from Mom or Dad. The multiplayer worlds are a huge part of the Minecraft experience. On multiplayer servers kids communicate, often through chats. In order to keep in the conversation, they must know how to read. Again, they are motivated. There’s no forcing or coercing to read. They just do it. As a result of playing Minecraft, my sons have gotten interested in a variety of topics such as biomes, survival, primitive tools and gemstones. We’ve made many trips to the library to find books on these topics. With the reading skills they’ve gleaned playing Minecraft, they are super readers and inspired to read books about the real things in life that correspond with their game. My boys never liked journaling or prompted writing. I tried it with them. They weren’t having any part of it. But Minecraft has awakened their inner artists, inspiring them to draw pictures and write stories about their experiences in Minecraft. . They’ve used online animation programs to create Minecraft stories and shared them with online communities. Spelling has improved immensely because they want to express themselves so that their stories are understood. As time has passed and confidence in their writing skills has increased, they aren’t as resistant to writing anymore. Their writing skills have flowed into all aspects of writing including using email, Facebook , writing letters and making homemade books. Multiplayer servers rely heavily on the chat section. And believe me, the kids want to communicate. Their writing skills improve on these chat sessions because they have the desire to be heard and to express themselves. The way they do that is through the written word. Minecraft provides lots of practice and practice, as they say, makes perfect. One of the greatest adventures in Minecraft is building. In order to build elaborate cities and structures, you can’t help but be exposed to math concepts. I’ve witnessed kids figuring out how many blocks it would take to build a massive building, doubling, tripling and even quadrupling that number in their heads and going on to build a visually pleasing, symmetrical building. I’ve never used flash cards with my youngest but the other day he found a set of multiplication cards and asked me to call them out to him. He got every one of them correct – without ever doing worksheets or working from a textbook. He’s built so many things in Minecraft that he’s taught himself. I’ve seen kids figure out how many minutes they have until “night time”, average the amount of food needed to go on a mining adventure, divide supplies evenly among players and estimate an area needed to build a city. The math concepts are all around them and they can’t help but learn them if they want to be successful at their game. Kids are ready for the changes that are taking place in the world. Whether they realize they are learning or not is beside the point. They are learning. And they’re enjoying it while they do. 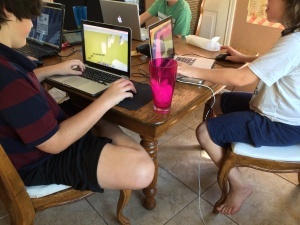 We as parents have the opportunity to connect with our kids, play Minecraft with them and look at their game as something more than just a game. Watch for the three R’s while they play. Notice what skills they are acquiring. Listen to them talk about what they are doing there. And relax, knowing that their desire to play is much more than play. It’s learning in the making. Subscribe to get updates on Minecraft articles – Coming soon! This article was first published in “The Homeschooler” magazine in their Winter 2013 edition. Learn more about The Homeschooler magazine here. You are currently viewing the archives for October, 2014 at Michelle Conaway.